As expected, we got the rise in the SPX’s zone to 2645-2655, but we rather doubt it is going to stop there. When we last published, R1 was at 2715, and today it has slipped to 2755, so all the while the ratios are receding above a rising zone. The fact that the ratios are building below it make three bullish signs. However, it has not really been about this index this expiry, the DJX and NDX have been the limiting factors. The huge Y ratio bandwidth remains a stark warning of the susceptibility to a shock. But, in the absence of any, there is little to worry about here, as anywhere for the expiry in the Y ratio would be fine, especially as it is in full-blown retreat. The first triple witching has come around quick. AND there is still almost 200-points of Y ratio bandwidth. So, shock susceptibility is as huge, the only question is whether the R ratios above the zone will hold fast or start retreating. 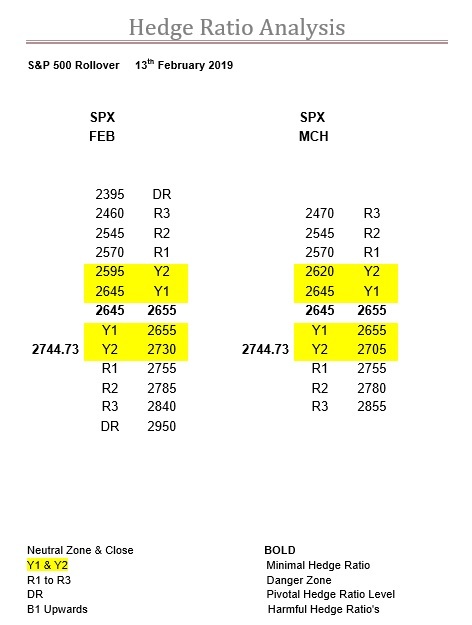 Also, we anticipate the zone moving up to 2695-2705, the question is when? FTSE and DAX contrarian ratios so divergence to continue. Today’s Ratio Table, levels and comment.